Between the 7th November and 19th December, Center Parcs will transform all five of its villages into spectacular Winter Wonderlands, then offer festive Christmas and New Year breaks up to the 2nd January 2017. Whinfell, Sherwood, Elveden, Woburn and Longleat will each be adorned with Christmas decorations, artificial snow and lit up with over 70,000 fairy lights. Guests will have an abundance of seasonal activities to choose from including carriage rides* around the village, meeting Santa’s reindeer and a party with Santa’s Elves, creating a magical wintery experience in the forest. This season Center Parcs is introducing their very own character to Winter Wonderland; Nutmeg the baby reindeer. He’s the star of Center Parcs’ first original storybook, Nutmeg’s Antlers, which is available to purchase at all Center Parcs villages until Christmas Eve. Parts of the Christmassy story will be built into unique sculptures, where guests can get closer to Nutmeg through virtual reality. Families with smart phones can scan a secret code and bring Nutmeg to life on their camera view, allowing grown-ups and their little ones to have their photos taken with this special reindeer. No break would be complete without taking your children to see Santa Claus in the lead up to Christmas. This year families not only get the chance to visit Santa in his Woodland Workshop, they can also meet Santa’s mischievous Elves and some of his most loyal reindeer. If guests would like to spend more time with Mr Claus and ensure that their child’s Christmas list is in safe hands, they can book a festive brunch with Santa and his Elves. Each year Center Parcs provides an array of Christmas activities to get guests feeling festive, from decorating Christmas cakes to getting messy in the pottery studio and much more. Families can get creative making baubles that can be taken home to decorate the family tree, take part in seasonal quizzes and carol services. Other activities not to be missed include the family friendly firework display and the Elves party, where children can dress up and dance with Santa’s helpers! Guests can soak up the magnificence of Winter Wonderland by taking a magical horse and carriage ride* around the forest. 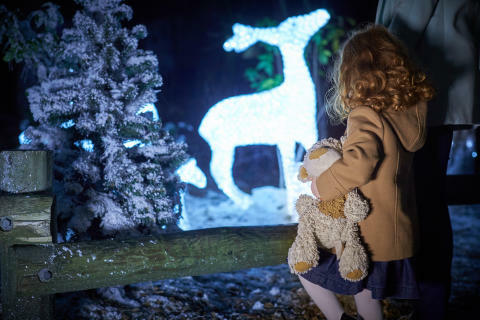 Families can cosy up in the carriage and take in the scenes of thousands of twinkling fairy lights, tonnes of snow and festive figures which transform the woodland. Sometimes it’s the little things that can be the most memorable at Christmas. The stylish accommodation at Center Parcs includes an open log fire, which guests can warm up by after a day of wintery fun on a chilly day. The villages are also frosted with a coating of glistening snow so there’s no need to watch the weather forecast, it’s guaranteed at Center Parcs. There’s still time to book a Christmas escape to the forest with a four night Center Parcs break beginning on the Friday 23 December. Guests can order a real Christmas tree complete with a selection of baubles, bows, beads and fairy lights for decorations to be delivered to their lodge ready for their arrival. Families who want a home cooked Christmas roast can pre-order a delicious Lincolnshire turkey to cook in their Lodge, or leave the cooking (and washing up!) to someone else by booking a table at one of the fabulous Christmas Day events held in the Center Parcs restaurants. The celebrations don’t stop at Center Parcs once Christmas is over – why not see in the New Year of 2017 on a pre New Year three night break from 27th December or a three night break from 30th December into January? Guests can choose from glittering parties where they can dance the night away, family quizzes where they can let their competitive sides out, then round off New Year’s Eve with a countdown to midnight and a spectacular fireworks display. The next morning, guests can start 2017 with a refreshing winter walk through the crisp forest. Breaks are subject to availability, please check website for prices.